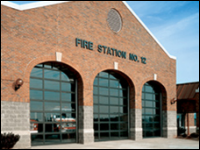 Overhead Door of Cleveland offers a comprehensive line of sectional steel doors, Thermacore® doors and commercial aluminum doors. We cover sales, installation, and repair of industrial sectional steel doors and aluminum doors. Our insulated steel products are one of the industry’s most complete selection of panel profiles, gauges, track styles and hardware for commercial sectional door systems. We have a large line of insulated and non-insulated sectional doors. We have the solution for your commercial dock door needs. Thermacore® is the premier insulated door available today. It is an ideal choice for applications that demand the highest levels of thermal efficiency, air filteration, and windload resistance. The industry’s most comprehensive line of Insulated and Non-Insulated Sectional Steel Doors. An excellent solution for applications where visual access and light transmission are key considerations.